The Number Four article is a discussion of optimized marketing spend. People seemed to like that a simple equation like the square root function can be used to help determine the increase in sales expected when advertising dollars are increased. Number Three is a comparison of branding verses selling. I compared the websites of Gap and Zappos, and discussed which style yields greater sales. Number Two is a discussion about how many times you should e-mail a customer each week. Read the article, and join the discussion about how many contacts a week you perceive to be appropriate. And your favorite post of the month is the Four Questions Segment with Jim Fulton! This article has been very well received, literally spreading like a virus across the United States and UK, driving close to half of total page views for a two week period of time. Congratulations to Jim for his writing style, content, and as a bonus, haiku! Yesterday, Don Libey left an excellent comment regarding branding. I mentioned that customers do not seem to rally around a dying brand. Rather, customers tend to bury a brand when it is near the end of its life. Click here to read my post about the end of a brand. Instead of referring you to his comment, I thought it would make sense to just include his comments as an independent post for your browsing pleasure. Excellent proposition. I would add that, not only is the relationship relatively shallow, but it is rooted in "utility," the classic element of economics. If I get the same utility from a non-branded box of soda bicarbonate as I do from the venerable and instantly recognizable Arm & Hammer brand, and if the price is less, I will likely choose the non-branded product, thereby invoking the ever-present economic element of "substitutes." If we look at strong versus weak brands, there are almost always echoes of utility and substitutes within the intellectual dialogue of the customer's decision-making processes. As a relevant example, the Ford Motor Company, in its present state of extremis, is failing to honor its extended warranty policies and, as a partial consequence, the brand has deteriorated due to a failure of utility (in this case, satisfaction). Of course, there are substitutes to that tired brand, and the marketplace has decided that Honda, Toyota, and other brands offer greater satisfaction and, therefore, greater utility. Like the four cardinal elements in the upper right corner of the Periodic Table of the Elements, there are only four classic elements to the branding issue: 1) Utility; 2) Substitutes; 3) Demand; 4) Supply. These are a linear relationship. All demand and--as a result--supply begins and ends with utility and substitutes. For a brand to be relevant and successful, there must be--in this order--utility, satisfaction, demand and supply. Marketers within any and all channels would do well to harken back to Economics 101 and reflect more often on the concept of utility. For the textbook study on massive brand failure, look at the entire airline industry. Brand value is almost non-existent because the entire industry is a 75-year failed experiment in transportation. There is no utility, no satisfaction, no profitability, and no substitutes; it cannot exist in its present economic structure and is, therefore, doomed to failure, bankruptcy and a subsequent re-invention of transport systems and structures. Unfortunately, because there are no substitutes, there is only demand and a poorly managed, inefficient, unprofitable supply. If there were high-speed inter-continental rail systems, both short and long-haul, there would be a lessening of demand on airlines and the system would either crumble entirely due to effective substitutes or be scaled back to something that delivered competitive utility at a competitive price. But, nowhere in this equation does brand have any relevance. Is it possible that we are in the sunset era of brands? I recently had a discussion with a business leader about the relevance of catalogs to a 25-45 year old target audience. As we move closer and closer to the year 2010, it seems that marketing channels are aligning with different target audiences. Catalog seems to be aligning with a 45-75 year old audience. E-Mail seems to be aligning with a 35-55 year old audience. RSS seems to be aligning with a 25-45 year old audience. Text messaging and instant messaging seem to be aligning with an under 35 year old audience. If you were starting a business, marketing to a 25-45 year old target audience, which marketing channels would you explore? Would you invest money in catalogs targeted to a 25-45 year old audience? I just finished watching Andre Agassi compete in the first round of the US Tennis Open. This is Andre's final US Open, and 20,000+ spectators literally willed him to win this evening. Eighteen years ago, Agassi was not the most popular person. But this evening, with his career nearly over, people celebrated the brand known as "Agassi". We do the same thing when a co-worker decides to leave a company. We forgive past transgressions, and celebrate all of the positives. We don't do the same thing when a brand is tired and weak, and ready to retire. We are more likely to bury a tired and weak brand. Few people rallied to support Montgomery Wards, when it was tired and weak. Not a lot of consumers are showing loyalty to GM or Ford, at a time when they are tired and weak. With brands, we are much less forgiving than we are with co-workers. Given the amount of money that changes hands between consumers and brands, and the ways that a brand will fall on the side of "increasing shareholder value", we probably should be less forgiving. The lesson of the past two days, for me, is that there really isn't a relationship between customers and brands. And if I am wrong, I speculate that the depth of a relationship between customer and brand is very, very shallow. This week, I am pleased to share a recent interview with Allen Abbott. I believe you will find his insights to be enlightening, as he freely offers his perspective on many different issues facing multi-channel retailers. Allen is Executive Vice President and Chief Operating Officer for Paul Fredrick MenStyle, a men’s fashion apparel direct marketer located in Fleetwood, PA. Allen has been involved in retailing for 30 years, 20 of those as a direct marketer. He has held senior marketing and management positions at Bloomingdale’s by Mail, Exposures and Day-Timers. Allen holds a B.A. in History from Lafayette College and an M.B.A in Management from Rutgers University. He resides with his wife and two sons in Orefield, PA.
Allen has been a speaker at various Direct Marketing Association events during his career. He has also served as a guest lecturer on direct marketing topics at Northwestern University and New York University. Let's begin our interview session with Allen. Question #1: You have the perspective to analyze how Direct Marketing has evolved over the past twenty years. What are the biggest changes you have witnessed, and what has surprised you about the evolution of Direct Marketing? It is hard for me to define exactly what the “biggest” changes have been, but one common theme among all large changes has been that they have been enabled by technology. The Internet, of course, has been the most visible one, since it has totally changed the dynamics of both marketing and customer service. But there have been other changes in technology that have been enablers in the printing, pre-press, photography and database areas. One of the more surprising developments to me was how slow traditional data processing service bureaus were to adopt new technologies to help improve their business models. Many of them held on to the “we run the machine, you pay” models long after the price of both hardware and storage had plummeted, limiting, I believe, their ability to grow with their customers. Question #2: Your business sells through a catalog channel and a website channel. Does a true multichannel retailer have to have an online, catalog and retail presence, and what is the brand impact of having or not having a retail presence? When CRM became the new buzz word several years ago, I and a friend of mine, who runs a list and Media Company, banned the term from our businesses. Our thought was that you don’t really manage customer relationships, since most customers don’t really believe that they have a relationship with you. What you really do is offer great products and great service as efficiently as possible, and hope that consumers respond to you often enough to grow a profitable business. I feel somewhat the same about the term “multi-channel retailer” as an industry buzz word, because it can take your focus away from what really matters – managing your brand. Certainly adding retail to the mix both raises your visibility to the consumer and offers opportunities to scale your business. It also requires a totally different skill set and additional resources. The question of adding retail to our distribution mix has never been a philosophical one for us. At this point we still see a lot of opportunity to grow the business within the set of skills we already possess. Question #3: Direct Marketing and Brand Marketing can be at odds with each other. Direct Marketing is often focused on selling merchandise to a customer today, whereas Brand Marketing sometimes focuses on building a long-term relationship with a customer. How might a Direct Marketer apply best practices in Brand Marketing, to insure both the short-term and long-term health of the business? I believe we sometimes confuse the concept of brand marketing with that of image advertising. My definition of brand value is the sum of every contact point you have with a consumer times the value of those contacts. Since the value of a contact can be positive or negative (think Vioxx), your brand value can also be positive or negative. Part of that brand value is certainly determined by the quality of your advertising, but that is only the beginning. The quality of your product, your customer service and your order fulfillment are equally important in determining the value of your brand. A clear, consistent brand message is critical to a positive brand value and a long term customer commitment, whether you are an image advertiser or a direct marketer. That said, I do believe direct marketers have learned from image advertisers, and vice versa. Direct marketers are paying much more attention to the consistency of their imagery and copy across different media then we did even five years ago. In the late 1990’s catalog companies were launching websites that had almost nothing in common with their catalog execution. Today, we are paying much more attention to assuring that the imagery and copy we present on our websites are consistent with what we use in our catalog. On the flip side, more and more image advertising now carries some type of call to action for the consumer, whether it is an 800 number on an automobile ad or a URL offering recipes on a food advertisement. Question #4: What things fascinate you about the organizational behavior of companies? During your career, what dynamics have you observed that yield a profitable business with satisfied customers and happy, loyal employees? Whenever I am considering working with a company, I always visit their headquarters to get a read on what the business culture is like. If I see one of those lovely framed photographs with an inspirational message from Executive Greetings, I immediately turn around and leave, since it indicates to me that the company is incapable of developing any unique culture whatsoever, and probably lacks imagination in general. I also enjoy talking to random people in the company to see how they feel about their work. When a junior account manager can give me five extemporaneous minutes on how she is going to help me improve my business, that is impressive. The dynamics surrounding successful businesses are fairly similar in my experience. First, you have to have a precise business mission that can be clearly explained to your employees, hopefully in ten words or less. I visited a database company last year whose stated mission is “100% customer advocacy.” That is extremely powerful to me, because it leaves no doubt in an employee’s mind about how he/she is to behave. Second, you have to have a compensation system that is 100% compatible with your company’s business goals. If the catalog manager and the web marketing manager spend 20% of their time debating about who gets credit for the order, performance will suffer. Third, and I think this is a subtlety that many people miss, you have to give your employees a reason to show up for work. It is not just about the money, and an employee who feels that he/she is challenged in their job and taken seriously in the company will perform at a higher level than one who comes to work just to follow someone’s instructions. Finally and somewhat related to the prior point, a performance appraisal system that supports your business objectives is a must. At Paul Fredrick, I read every salaried employee’s self-appraisal, as well as their supervisor’s appraisal, before the two actually meet. I am looking to see that both individuals have a similar position on how the employee’s goals were met during the past year, as well as that goals for the new year are both clearly measurable and support the overall company goals. If you have motivated employees with a clear business mission, you have a better chance of pleasing your customers. This article from The Onion, was found on http://www.marketersstudio.com/. I find this brief article so funny! Those of you who know me understand that I am not a huge fan of "Brands", and am even less supportive of "Brand Marketing". If you were to rank-order all of your relationships, from number one, to number ten-thousand, where would your favorite coffee chain rank? Do you really have an emotional attachment with a "Brand" that sells coffee? Do you honestly have an emotional attachment with a "Brand" that sells an expensive pair of shoes? When you visit your local fast food restaurant, do you honestly have a better relationship with the fast food "Brand" than you have with your family, your friends, or your co-workers? If you do have a relationship with a "Brand", especially a publicly traded "Brand", what do you think the nature of that relationship is, when seen from the viewpoint of the "Brand"? How do you think the "Brand" views its relationship with you, when its objective is to increase shareholder value? Will the "Brand" act in a selfless manner with you in the way your friends or family will act in a selfless manner with you? This brief story in The Onion exaggerates the relationship we humans have with "Brands". And yet, there is a fundamental truth in what they wrote. The National Football League begins its season in two weeks, and I will choose to not visit church on Sunday morning, so that I can watch a 10:00am football game featuring the Green Bay Packers. I will set my relationship with God aside so that I can have a relationship with the "Brand" known as the National Football League. At some point, all of us put a relationship with a "Brand" above other more important relationships. All of us who work in Marketing, and even folks like me who specialize in Database Marketing, work hard every single day to "drive our Brand". And by doing so, we unintentionally create false relationships between "Brands" and "Individuals", relationships that sometimes take priority over the relationships we humans have with family and friends. We cause our customers to feel that they actually have a relationship with a "Brand". We then cause customers to unintentionally choose the brand over actual human relationships. When push comes to shove, the "Brand" will abandon the customer whenever it benefits the "Brand". "Brands" will close stores when they cannot make a profit, disappointing the very customers who had a relationship with the "Brand". The "Marshall Fields" brand will be sold to another brand, and the "Marshall Fields" brand will be converted to "Macys". How important is the relationship between customer and "Brand", in that instance? At the end of the day, marketers need to simply sell a quality product at a fair price, providing the best customer service possible, replicating perfect transaction between "Brands" and customers over and over and over. That's all that really needs to be done. It isn't easy to do. But in the long run, the "Brand" cannot possibly hope to have an intimate relationship with a customer. In the long run, the "Brand" must make decisions that are not in the best interest of the customer. By focusing on quality product, sold at a fair price, offered with great customer service, the "Brand" can hope to survive as long as is possible. And that is really what a "Brand" needs to do. How Do Your Customers Use Your Website? 42% of visitors arrive at the website with no referring URL. Many have AOL as their ISP. 20% arrive via a query from a search engine. Almost all search traffic comes from Google. 18% arrive via links to my website on other blogs. 29% arrive via RSS subscriptions or Feedblitz subscriptions. 39% arrive at my homepage. 61% land on a specific permalink for one of my posts. Let's think about these numbers in the context of your business. Assume twenty percent of your traffic arrives via a search engine. You have essentially given control of one-fifth of your business to Google, Yahoo! and MSN. How do you feel about that? I'm pretty certain Google, Yahoo! and MSN feel good about it. How do you regain control of your business if that percentage significantly increases, or if the search engines decide to use an algorithm that sends less traffic to your site? Online retailers need to think hard about how much control they have ceeded to search engines. On the surface, the traffic that comes from search engines seems like it is all incremental business. I highly doubt that it is. Three in ten visitors come via an RSS or Feedblitz subscription. These visitors seldom, if ever, get to my homepage. They go to a permalink, or they simply read a post via e-mail, without ever visiting my site. Are there ways that your online business uses technology, so that your customers are interacting with your business, without ever visiting your website? Nearly one in five visitors come from a link on another blog. These are similar to the affiliate programs that drive business for many online companies. Are there other websites that have a similar demographic/psychographic with your website, websites where co-branding opportunities exist? I cannot track where four in ten visitors come from. This creates problems for me, since I cannot identify why forty percent of my traffic chose to visit me. How do you deal with an inability to identify where your online visitors are coming from? My visitor statistics illustrate how business has changed over the past decade. Ten years ago, catalogers drove their business via catalog titles, catalog frequency, and customer acquisition via purchased lists, exchanged lists and compiled lists. Five years ago, multichannel marketing began its ascention as customer migrated from the telephone/catalog channel to the online/e-mail channel. Today, technologies like RSS and Feedblitz transform the visitor experience, while search engines have inserted themselves into our business models, with and without our permission. The Norton Anti-Virus era ended at the Hillstrom residence. Eight glorious years of virus protection came to a halt yesterday. The good folks at the Geek Squad paid us a visit, and for the low fee of nearly $360, they magically restored my wife's laptop computer to functional status. Our "agent" (that's what the Geek Squad calls their associates) told us that he sees many computers that have been rendered nearly functionless by Norton Anti-Virus 2006. Ours was one of them. After removing Norton Anti-Virus (not as simple as doing an "uninstall"), the technician installed an anti-virus, anti-spyware version of software from Microsoft. Within seconds, my wife's laptop sprang to life. If you were an executive at Symantec, how would you respond to an onslaught of problems of this nature? How do you restore faith in your product with a previously loyal customer base burned by software defects? If you were an executive at Symantec, would you compensate me the $360 I spent to have my machine fixed? Yesterday, I focused on the customer file dynamics required to grow Netflix. Netflix keeps maybe 70% of existing subscribers, on an annual basis. In order to grow, and grow quickly, Netflix must focus marketing efforts on customer acquisition. We would all grow our businesses rapidly, if there weren't significant costs associated with customer acquisition. In 2003, Netflix spent $31.79 per new customer. In 2004, Netflix spent $36.09 per new customer. In 2005, Netflix spent $38.08 per new customer. And in the second quarter of 2006, Netflix is spending five dollars more to acquire new customers than last year. In other words, it is getting harder and harder for Netflix to find new customers. Folks who run direct-to-consumer or direct-to-business organizations thoroughly measure the cost to acquire customers. Some leaders develop relationships that help estimate how much it would cost to acquire customers, if spending is really ramped-up. Each company has a different relationship between marketing spend and cost per customer acquired. A quick rule-of-thumb (remember, this is different for every company), a starting point, is to take the square root of your spending increase. 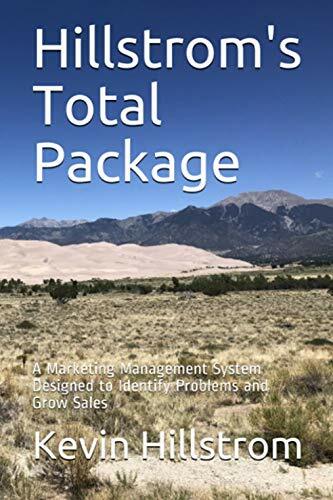 For instance, if your company wanted to double marketing spend, you take the square root of two, yielding a forty-one percent increase in cost per new customer. By looking at my Netflix Customer File Dynamics Worksheet, you can see how I chose to trend the increase in cost per new customer. Using a statistical model (instead of the square root rule), I estimated a $41.50 cost in 2006, $44.15 in 2007, $46.33 in 2008, and $48.06 in 2009. Next, I estimated the marketing spend required to grow the file at an acceptable rate. These figures are estimated in the Marketing expense line. By applying the customer file dynamics illustrated in yesterday's post, and cost per new customer estimates as outlined in this post, scenarios can be outlined for Netflix growth. In this case, I outlined total revenue and profit through 2009. The scenario I outlined takes the business from $682 million in 2005 to nearly $2 billion in 2009. Marketing expense would increase from $142 million in 2005 to $485 million in 2009. In order for Netflix to grow, it would have to continue to focus all efforts on customer acquisition. And this growth comes at a cost. The scenario indicates that spending so much money on customer acquisition, to grow quickly, limits pre-tax profit to no more than around eight percent. Slower growth results in a greater rate of pre-tax profit. Faster growth results in a lower rate of pre-tax profit. So those are the scenarios that executives at companies like Netflix need to run. By understanding the retention rate of existing customers, the cost per new customer, and the elements of a profit and loss statement, an executive can chart a course to success for an organization. This exercise illustrates the growth potential that exists for Netflix, as long as they continue to focus on affordable customer acquisition activities. The exercise clearly illustrates how much effort must be put into customer acquisition, for Netflix to succeed. What none of us can identify is the limit to customer acquisition at Netflix. None of us really know how many families want DVDs sent to them through the mail. Is it the 14,500,000 subscribers needed by the end of 2009 to make this scenario work? Or is it a much smaller number, like 9,000,000? Only time will tell. Netflix is an interesting case study in the development of a direct-to-consumer business. In their most recent annual report, Netflix published five years of financial results. This allows us to follow the development of their business. Of interest is the growth of their customer file, coupled with their stated "churn rate" of about 4.3%. What follows from this point forward is purely speculative on my behalf, and is not representative of actual facts or findings published by Netflix. Netflix states that the churn rate is lower for existing subscribers, and initially greater for new subscribers. If we estimate an approximate 2.5% to 3.0% monthly churn rate for existing subscribers, this yields an approximate 70% annual retention rate. Furthermore, if new subscribers churn at a 7% rate, this yields an average six month retention rate of about 63%. Let's use these two assumptions to understand the dynamics of the Netflix customer file. At the end of 2005, Netflix had 4,179,000 active subscribers. If, during 2006, Netflix is able to keep 70% of these subscribers, then 2,925,000 subscribers remain at the end of 2006. If Netflix wants to continue to grow, it has to replace the 1.2 million subscribers it lost, find more new subscribers, and then find even more new subscribers to overcome new subscribers that will be lost during 2006. Let's assume that Netflix finds 5,387,000 new subscribers, and keeps just 63% of these subscribers. This yields 3,394,000 new subscribers who are still subscribed at the end of the year. The 2,925,000 existing subscribers, and 3,394,000 new subscribers yield 6,319,000 subscribers at the end of 2006, a fifty percent increase in subscribers, roughly equal to the growth in customers over the past two years. This is important to call out for a couple of reasons. Even though Netflix does a great job of retaining an estimated 70% of its existing subscribers, it still has to find a staggering 5.4 million newbies to overcome attrition, allowing Netflix to grow quickly. This is a fact that retention pundits frequently miss. The "it costs 'x' dollars more to acquire a new customer than it does to retain an existing customer" is entirely factual. However, pundits occasionally use this quote to create fear among business leaders, causing the leaders to buy retention-based "solutions". This example shows how critically important customer acquisition is. Netflix must focus its energy on acquiring new customers, or it simply won't grow at a rate acceptable to investors. Netflix could retain 100% of its customers, and it wouldn't grow. By using a very simple customer file dynamics example, we can illustrate how easy it is to project the growth of a company. Customer file dynamics are critically important to understanding, and determining, the strategy of a company. Of course, growth must be tempered by the cost of acquiring customers. In tomorrow's essay, I will explore how the increased customer acquisition costs influence the growth of a customer base, and ultimately dictate how fast and how profitably a company like Netflix can grow. For those of you who want a preview of tomorrow's discussion, check out this spreadsheet, one that estimates future Netflix growth based on a series of assumptions that I made up, assumptions that are not reflective of any statements made by Netflix. Again, any information I am sharing here is only for illustrative and teaching purposes. It is not meant to actually forecast the estimated growth or profitability that Netflix can expect. Netflix recently received attention for increases in the cost to acquire new customers. Over the course of the next few evenings, I will explore some of the customer file dynamics that make Netflix such a fascinating case study. Netflix released quarterly financial performance on August 9. Subscriber acquisition costs increased from $38.13 last year to $43.95 this year. This means it is becoming harder and harder for Netflix to acquire new customers. Netflix also announced a monthly churn rate of 4.3%. If we apply some algebra to this churn rate (1-0.043)^12, we find that Netflix has an approximate annual customer retention rate of 59%. In other words, Netflix retains 59 out of every 100 subscribers, on an annual basis. In order for Netflix to maintain flat sales, they must recruit another 41 new subscribers to replace those lost. In order for Netflix to grow, they have to recruit far more subscribers. In order for Netflix to grow fast, they must focus their marketing activities almost entirely on customer acquisition, because no reasonable increase in annual retention rate can generate enough sales to grow fast. Over the next few evenings, I will explore how fast Netflix can grow, given the constraints of their cost per new customer metric. I will estimate how expensive it could be for Netflix to grow rapidly, and illustrate the long-term financial impact of short-term growth via customer acquisition. In other words, get ready to sit back and enjoy some good 'ole fashioned Customer File Dynamics, applied to Netflix!! The Carnival of Marketing is coming to MineThatData on September 10! In this Carnival, bloggers submit relevant marketing posts they wrote from the week prior to September 10. The host (that's me) takes a look at all submissions, and features the seven best posts of the week. If you want to see what last week's Carnival looked like, click here. If you want to submit a post for a future Carnival, click here. I look forward to receiving your submissions for the week of September 3-9, and be sure to visit on September 10, and give these bloggers some attention. David Daniels at Market Ventures has this post about Chief "X" Officers (CXO's) who host their own blogs. Some of the blogs may be of interest to you. Give this little exercise a try. Visit www.amazon.com, assuming you are automatically logged-in as an existing customer. A page customized just for you should appear. In my case, books about ecological statistics appear, which is a problem, because I last purchased a book on ecological statistics seven or eight years ago, and have no interest in doing so ever again. So I hit the "refresh" button at the top of my Firefox browser.. And a new page appears. My recommendations disappear. New products appear. So I hit the "refresh" button again. Again, a new page appears, featuring new products, dynamically loaded for my viewing pleasure. When I put on my "Database Marketing Executive" hat, I feel embarrassed. It feels like technology has passed me by, and the skills I have to deal with the modern world are hopelessly lost in a time-warp where I am competing with Montgomery Wards. But then I put on my "Amazon Customer" hat, and I see that Amazon, for all of their technological genius, has no idea who I am or what I am interested in. In addition to the outdated preferences in reading material, they featured furniture, five-hundred of my favorite beauty brands (huh? ), a Veronica Mars DVD, a back-to-school MIDI controller, and a recommendation to visit one of their partner sites, "Weight Watchers" (ok, maybe they know me a little bit better than I thought). As Database Marketers, we shouldn't use technology just because we can use technology. If we can use our fancy mathematical algorithms to effectively target merchandise that is relevant to my lifestyle today, then by all means, we should take advantage of the technology. But if the end-result is what Amazon presents to me, then the technology can negatively impact the relationship between customer and brand. The merchandise a company offers should be the primary factor influencing a purchase decision, not the shortcomings of a targeting algorithm created by a database marketer. Looking to do something different with your career? Why not become a Database Marketing pundit? Oh sure, you could do what I am doing, and not get paid for it. But in today's modern world, it is acceptable to get compensated for your hard work. Check out this position at Forrester Research. If you have the appropriate credentials, this might be an interesting career choice. Heck, you could cover the activities and concepts discussed on this blog! Which Elements Of Business Strategy Truly Drive Top-Line Sales? Back in the day at Eddie Bauer, I would get questioned about the customers my team chose to mail catalogs to. If a catalog were ten or twenty percent below plan, our merchandising community would question whether my team were targeting catalogs to the right individuals. There was no way I could reasonably defend myself. At a six percent response rate, I was wrong ninety-four percent of the time. So no matter how I answered, I knew I could always do better. Then my Vice President would chime-in to the discussion. He always said, "Seventy percent of the success of a catalog is due to the merchandise offered, twenty percent is due to the creative presentation of the merchandise, and ten percent is due to the households you target the catalog to." I have no idea how he developed these relationships. I have no idea if they are correct, either. My perception is that merchandise represents sixty-seven percent of the success, creative presentation seventeen percent, and targeting strategies sixteen percent. If the merchandise is not appealing, there's no amount of presentation or targeting that can save it. What do you think? Looking at the online business you are responsible for, what percent of your success is due to merchandise, creative presentation, or targeting strategies? What role does branding play in this equation? Let me know your thoughts! Paul Stuit was kind enough to tackle the "Four Questions" challenge at MineThatData! Paul is Vice President of Sales for the Northwest Region of Strategic Paper Group. Prior to his work at Strategic Paper, Paul spent twelve years with RR Donnelley as an Account Executive for Northwest catalogers and publishers. During the past thirteen years, Paul has worked closely with Marketing, Creative, Publishing and Production departments in the Northwest to find creative solutions for increasing the cost effectiveness of mailing campaigns. Paul has an MBA from the University of Washington, and a BA in Business and Finance from California Polytechnic State University at San Luis Obispo. Paul can be reached at 1-800-633-9894, 425-557-0114, or at pstuit@strategicpaper.com. Question #1: What impact has multi-channel marketing, and the internet in particular, had on the printing industry, and how has the printing industry evolved to deal with these changes? Paul: During the initial dot com boom, the expectation that the printing industry was due a rapid decline turned out to be premature. In fact, the printing, paper and other direct mail product/service suppliers found the new internet channel growth to be something of a boon. As online marketers have sought to get their message to the consumer, they have found ever increasing competition for consumer attention, a growing need (or perhaps awareness) for relevance of the message to the individual, and the cold, hard truth that no matter how sophisticated the site the internet has been built as a retail destination or portal with a rather small marketing reach for those who are not otherwise drawn to it. Since the quiet of this boom (and bust for some) era, the internet has continued to grow more steadily. As this has happened over the last ten years, technology and acceptance of the internet have matured together. To the credit of those who foretold of the replacement of the printed marketing page with electronic media, there has been clear evidence of the replacement of snail mail with electronic mail in marketing. Though much of my feeling on this is based on anecdotal research, I believe that there has been a weeding out of marketing commerce that has resulted in the shift of impetus for a purchase from a traditional marketing call to action to loyal and internet-aware/savvy customers simply going to their favorite retailer’s site to browse and buy, or simply to a favorite search engine to do a quick scan of the market to find out what the more efficient market has now determined that the actual price of an item should be. So now, in addition to ever increasing raw material costs for print and regular increases in postal rates, we have more informed consumers, a more efficient market and a third, very convenient channel that serves as an opportunity to browse, purchase and/or research for purchase decisions. So, direct mail marketing activities that were formerly effective by the fact that there was no other means to reach target-able customers may have become less effective, and may have found themselves replaced by more efficient and targeted print/mail campaigns or more cost-effective email campaigns. As a result, service bureaus have had to develop more integrated mail/e-commerce offerings printers have had to address more complexity in the bindery and versioning in the press room, while fighting for their share of a relatively shrinking pie. For printers, these moves can be costly, and for many smaller, regional printers, the opportunity cost of continuing investment in the business has ballooned to an unacceptable level, bringing about industry consolidation. As in the stabilizing and mature stages of any industry life cycle, the strongest will survive and seek to manage the supply end of the balance of print utility. Question #2: In what innovative ways might a small company, selling merchandise only through the online channel, use print to drive customers to their website? Paul: Print is certainly effective. While e-mail is arguably the most cost-efficient way to reach a modern audience, it may not be the most cost-effective (assuming the latter definition carries a stronger focus on conversion to sales/profit). The ease with which one can delete or filter incoming e-mail messages and the continuing political pressure to provide consumers with privacy have created an environment hostile to spam or even to more welcome email invitations that have not been specifically authorized by the receiver. In recent years, the same emphasis has been placed on telemarketing. To date, no one has successfully found a filter for direct mail, save the ever increasing cost of postage. In addition to relatively unencumbered access to the consumers’ mailbox, it is arguable that there is no better targeted medium for the quality representation of brand, images and message to the consumer. So, while a simple postcard may end up costing the mailer over $.30 each to mail (compared to a fraction of a cent for email), the customer has little choice to at least scan the card for relevance to their current interest before deciding to take the piece to the recycling bin. At the least, the consumer is exposed to your piece for a few seconds and must make a relatively conscious decision about its value. In the course of a day, the effort to sort mail and make a trip to the waste bin seems insignificant, but relative to the ease of clicking delete, the impact of an email header or the invisibility of messages screened by filters, the value is significant. However, as alluded in the previous question, targeting is more important than ever for marketers to bring about cost effective results. Simply throwing a stamp on a piece and sending it “out there” will provide minimal effectiveness. It is recommended that careful thought be given to coordinating the design, layout and message with known customer attributes before finalizing your mailing strategy. This is a process that will improve as the mailer learns more about how they specifically fit into the commercial lives of their target market(s), but there is help available via consultative experts to ensure the proverbial wheel is not being reinvented on the first mailing. Question #3: What companies do you think do a great job of balancing selling merchandise, and brand marketing, via direct mail? Paul: This question is tougher to answer as the true results to brand marketing come over a longer period of time and are less measurable than response rate, and because many companies keep the metrics for these results private or buried within the larger sales numbers. In my own experience, I believe the mailers who are most effective in this area are those that provide consistency of brand across all channels. Within “brand” are perceptions of service, quality, value, etc. that must be consistent as well. To deliver on service in the mail is difficult, but not impossible. Providing an easily found toll free number and web site address, are helpful to showing the consumer that you are there to help. Delivering on price is not so difficult here, but very important. Communicating different prices on a mailer than are available in the store can create confusion or frustration that ultimately runs counter to your goals. Delivering on quality in the mail can be done in many ways. From the grade and finish of the paper you use to the layout and design of the piece and the photography used, you make statements that create impressions in an instant. Companies that are careful to merge these aspects with an understanding of their customer (suggesting some care went into the selection of names as well) can use the direct mail channel to advance their relationship with the customer and reaffirm their position in the customers’ buying/shopping preference set, logically increasing or at least maintaining share of the customers’ wallets as well. Question #4: If you were an executive at an online, catalog, or multichannel retailer, what are the big issues that need to be dealt with over the next three years, and what advice would you offer to deal with these issues? How to increase relevancy to the target audience in the face of growing numbers of competitors (globalization, internet, etc.). How to manage spending mix between brand development/maintenance and selling; between mail, e-mail, web ads and mass audience marketing. How to address/embrace globalization of supply, competition and consumer markets. Here is an interesting strategy. I needed to uninstall my Norton Anti-Virus software, due to performance problems the software may be causing on the PC. I went out to their website, http://www.symantec.com/index.htm, to download another copy of the software I purchased in April. And it was there that I was greeted with a $6.95 fee to again download a copy of the software I licensed this spring. Had I paid more when I purchased the license, I could have had unlimited download opportunities. I imagine that Symantec earns at least $6.50 profit, if not more, from this transaction. The logic almost seems circular. If their software creates a problem on my PC, I have to pay them to fix the problem they created on my PC. So I ask this question of those of you who are cross-sell, up-sell, or CRM fans in the audience. Is this a good business practice? As a customer, how do you feel about this? Now put on your CEO or CMO hat. How do you feel about this? This week, I begin a new segment on MineThatData. Blatantly copying the strategy of Guy Kawasaki, I present to you "Four Questions". My first guest is Database Marketing consultant Jim Fulton. I worked with Jim at Lands' End, back in the early 1990s. He might be the most talented individual in Database Marketing when it comes to understanding the dynamics of a customer file, understanding how actions taken today influence the customer base in the future. Jim Fulton wrote his first SPSS program in punch cards in 1981, and began his database analysis career at Lands' End in 1986. He founded Customer Metrics, Inc., a database marketing consultancy, in 1999, when his doctor told him he wasn't getting enough airline food. Jim lives in Madison, Wisconsin. Jim has a wonderful sense of humor, which will become apparent as you read the answers to the questions I asked of him. And with that, let's begin "Four questions"! Question #1: We hear about multi-channel marketing everywhere we turn these days. How is multi-channel marketing in 2006 different than the challenges a cataloger with multiple titles faced back in 1991? Jim: I’d like to answer that question in two ways; first, using the spare, minimalist form of haiku, and then in a more normal, consultanty form of prose. Add the web? Oy vey. I think in both cases, the strategic imperative is to maintain an enterprise-level understanding of customer behavior. In the case of a multititle cataloger, the issue of cannibalization is reasonably straightforward: given finite discretionary or impulse spending capacity of any individual customer, the idea that mailing Title B to a group of customers who just received Title A will cannibalize Title A to some degree isn’t especially controversial. The growth of the Web has brought with it – in a lot of organizations – a considerable degree of wishful thinking, in the sense that they somehow hope that the Web is a game-changer in terms of customer file dynamics, that maybe if we do all these contortions on Web site usability and optimize our SEO and line up the right affiliates, then we won’t have to do all of that icky nasty customer acquisition and wouldn’t that be nice? This is, to some degree, still an overhang from the dot com bubble when everybody and their brother was looking at floating their dot com division, but I think at this point organizations should be looking at the Web as a means to an end, not an end in itself, with the ultimate end being cost-effective customer retention, reactivation and acquisition. The physics of the business haven’t changed, and to some degree web investment can be thought of as a defensive investment, something you have to do to remain competitive. Question #2: If a catalog and online merchant had an additional $500,000 to spend marketing to customers, how would you advise they spend that money? If we posit that a database marketer’s first rule of resource allocation is “don’t overpromote anyone, don’t underpromote anyone,” and if we further posit that this $500K is not to be spent, for example, on contact strategy testing on the top of the file, I would in general advocate a fairly even split between testing promising but untried new customer acquisition sources, and getting a bit more aggressive with customer reactivation efforts. Both of those opportunities have a tendency to get rather short thrift in the budgeting/planning process, and yet both of them – properly and realistically understood – can provide current year EBITDA contribution and build the business for next year and beyond. Obviously, some fraction of that $500K can usefully be spent on database marketing consultants as well. Question #3: What role does brand marketing, and brand advertising, play within the marketing mix of a catalog and online merchant? A brand’s relevance to a consumer is critical, and in my view advertising or sloganeering can be borderline irrelevant to that objective, if not counterproductive. Oops, pardon me a moment, while I go douse my effigy being burned by the Politburo of the American Association of Advertising Agencies. I think there’s a fallacy that your marketing or advertising efforts can, entirely on their own, create customer loyalty. My view is that customer loyalty can never be bought, it has to be earned, one customer at a time. And that’s as true today as it was when pre-Biblical merchants sailing the Mediterranean first contemplated whether to add PayPal to their payment options. Question #4: What are the projects that you most enjoy working on? I have had the good fortune of being able to work on a wide variety of projects, with a wide variety of clients, all over the US and Europe, and in looking at the ones that I enjoy the most, they all include bright people who are eager to learn and re-think how they approach their businesses. In the seven years that I’ve been consulting, I’ve developed something of a niche as a “geek mentor” and the most rewarding experience for me is when I am working with someone on understanding their customer base and I can almost see the light bulbs going off. I did an article a few years back for the Seattle DMA on how to hire, train and develop database geeks and that has to be one of the most fun things I do. (Original article here: http://media.whatcounts.com/dmaseattle/ThoughtsonGeeks.pdf). How Many Times Should You E-Mail A Customer Each Week? Here is an article from DMNews, authored by Philippe Suchet, CEO of Kefta. Kefta is a company specializing in dynamic online targeting. The article advocates dismissal of frequent, untargeted e-mail blasts, and outlines several qualitative reasons why this practice should be stopped. Situation #1: Four e-mail campaigns per week. E-Mail list = 10,000 names. Each week, 500 names are added to the e-mail file. Each week, 450 names opt-out/unsubscribe, or become invalid. Across a typical week, the four campaigns total $12,000 net sales and $2,000 profit. Situation #2: One e-mail campaign per week. Each week, 350 names opt-out/unsubscribe, or become invalid. Across a typical week, sending just one campaign yields $5,000 net sales and $833 profit. It is your turn to play virtual CEO. Do you over-contact your customers, and generate more than double the profits, or do you contact your customers less frequently, and sacrifice $1,167 of profit per week? When we play the role of "customer", the answer appears cut and dried. We wouldn't over-contact the customer. When we play the role of "CEO", our objectives may be different. The scenario where four e-mails per week are sent results in a 30% increase in opt-outs/unsubscribes. However, there are fewer names leaving the database than being added to the database. As a result, the CEO is likely to advocate four e-mail contacts per week. Ok, time to share your point of view. You are the CEO. Which e-mail contact strategy do you implement, and why? If you are like me (and I doubt you are), and you spend your evenings wondering what you are going to write about for your next blog entry, you have run across countless online discussions about The Long Tail, a new book written by Chris Anderson. I have not read his book, but I have followed his blog and online discussions about the book. My interpretation of his thesis is that the internet allows companies to profit by marketing niche products to various customers. For instance, Apple's iTunes store does not bear a significant incremental cost by carrying Robbie Dupree's early 80s favorite "Steal Away" (ok, maybe that's one of my early 80s favorites). As a result, iTunes can appeal to a wider audience with virtually no additional overhead, yielding increased profit. Furthermore, Anderson would suggest that somebody like me can have a healthy blog by writing content that appeals to a small, but enthusiastic audience (that's where you come into the picture). So far, Anderson's theory has proven true, in the case of MineThatData. Of course, Direct and Database Marketers understand the challenges surrounding inventory management, especially management of styles with limited and unpredictable selling behavior. When inventory management is practiced in a flawed manner, the impact on the profit and loss statement is disastrous. I never directly analyzed the impact of an increase in assortment/styles/skus on customer behavior. Can the retention rate of loyal customers be increased from 60% to 70% by increasing skus from 100,000 to 200,000? 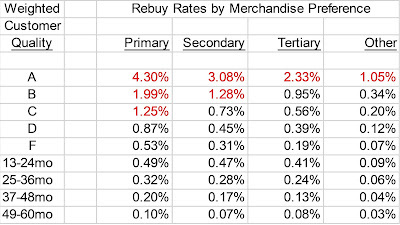 Maybe retention rate doesn't increase, but items per order, or annual purchase frequency increases because of an increase in skus. My guess is that a dramatic increase in skus does not result in dramatic increases in retention rates, items per order, or increased purchase frequency. My guess is that a dramatic increase in skus could increase the audience who might purchase from your company. Do any of you have any experience analyzing this topic? Even if you don't have any experience with the subject, what impact do you think increased assortment has on customer loyalty, purchase frequency, items per order, or the size of an audience willing to purchase from your brand? What Should You Do With Your Career When Your Company Is Failing? I read this post on the Business 2.0 blog, about a Microsoft employee leaving the company. I have worked at five different companies. Only once did I leave a company because the ship was sinking. I could not see any way that I or the company could be successful. To me, the culture was not able of overcoming its problems. Have you ever worked at a company that was sinking? What did you decide to do? Did you ride out the lows, and help turn around the company? Did the company eventually fail, or downsize your position? Did you leave, and if you did, why? What do you think is the right employment strategy when a company is going through challenging times? Sometimes, Database Marketers get caught in the crossfire of the age-old discussion between branding and selling. Visit www.gap.com. Notice how the homepage is merchandised. Or notice how the homepage is not necessarily merchandised. Gap advertises a theme, a reason to purchase, during the dog days of summer. Even more interesting, Gap chooses to dedicate eight lines of valuable homepage real estate to the terms and conditions of various promotions. Internet Retailer estimates that Gap converts 2.92% of homepage visitors to purchasers at an average order size of $85, yielding $2.48 per visitor. Now visit www.zappos.com, an online shoe retailer. Zappos views home page real estate as being essential to capturing customer interest. No square inch of the homepage is ignored. Internet Retailer estimates that Zappos converts 5.20% of their visitors to a purchase at an average order size of $100, yielding $5.20 per visitor. Given Gap's "brand recognition" and "brand heritage", it is surprising to see that Zappos, with just seven years of history, is twice as efficient at converting visitors into buyers than Gap. Now Gap may lose some sales to their retail stores, thereby cannibalizing online potential. Still, the difference is staggering. If you are a marketer, which of these two approaches do you think is more effective at driving sales? If you are a brand marketer, how do you defend Gap's homepage strategy against Zappos? If you are a marketer who believes that each square inch of the homepage is valuable real estate, how do you defend the potpourri of merchandise on Zappos, compared with the clean presentation of Gap? In dire need of acquiring more memory for my wife's notebook computer, I visited www.compusa.com, identified that CompUSA carries the memory I need, failed to print the webpage featuring the memory I wanted, got in my car, and drove thirty miles to the nearest store. At CompUSA, I failed to see the memory I needed, so I stopped at their repair desk, and asked the nice young lady to help me. The employee paged another employee, who had a key to get into the file cabinet where the memory was stored. Both employees spent five minutes searching for memory for me, before informing me that CompUSA did not carry the 1GB memory that I needed for their PC. Now, I'll fully acknowledge that I could have done a better job of researching the product online, and I could have driven to the next closest CompUSA store (about 20 miles away), to see if they had the product. Instead, I drove home, and tonight, I plan on ordering memory online. Ok, all of you multichannel pundits. How should CompUSA run their multichannel business model? Obviously, they cannot have all skus available in their stores, or they would run into enormous inventory issues in their stores, thereby rendering the stores unprofitable. Pundits will tell you that you should be able to order merchandise online, and pickup in the store. However, I wanted my merchandise today, I didn't want to wait a day or two until the merchandise was shipped to the store (and CompUSA does not have this service, to my knowledge). So how do you think CompUSA should run their multichannel business model, in a way that meets or exceeds customer expectations, but makes certain that CompUSA runs their business profitably? What ideas do you have? Last week, DMNews reported on an initiative at Dell to optimize marketing spend across all channels. Database Marketers are good at building tools that help marketers understand the best way to optimize their marketing spend. One of the most convenient and formulas used by Database Marketers is the square root function. For instance, assume a company generates $10,000,000 of sales on marketing spend of $2,000,000. If the company wanted to increase marketing spend from $2,000,000 to $3,000,000, it is common to take the square root of the increase ($3,000,000 / $2,000,000 = 1.50 increase), and apply that to sales. In this case, an increase of marketing spend from $2,000,000 to $3,000,000 causes a theoretical increase in sales to (1.5^0.5) * $10,000,000 = $12,247,449. The challenge Dell would have to face is quantifying marketing activities that are not easily measured. For instance, Dell recently started a new blog. How does a Database Marketer quantify the impact of this initiative? How about television advertising? Without good matched-market testing, it will be a challenge to accurately measure the incremental benefit of this form of advertising. If the incremental impact of advertising can accurately be quantified, formulas as simple as the square root function, and a simple spreadsheet, can be used to measure the optimal level of marketing spend. In lieu of having accurate information, let's get your opinion. If Dell had an additional $5,000,000 of marketing spend available to them, how should they spend it? Should they mail more catalogs to existing buyers or new buyers? Should they pay for various keywords on search engines like Google? Should they pay for portal advertising on a site like Yahoo!? Should they pay for television ads? Should they pay for radio ads? Should they pay for newspaper ads? Should they pay for magazine ads? Are there any other advertising avenues you would suggest Dell pursue? Let's hear your thoughts on this topic! The conversion to this blog means old posts have been archived for your convenience. Please visit www.minethatdata.com/archived_nuggets.html, and enjoy commentary from April 2006 - July 2006. For whatever reason, I follow the blogging efforts of Debbie Weil. This individual spent about one year writing a blog, always talking about concepts congruent with her book. Next thing you know, she has somewhere between 500 and 1,000 visitors a day, based on traffic data from Alexa and my estimates of their reach per million visitors. So after a year of faithful blogging, her book debuts highly ranked on Amazon. This example illustrates how marketing has changed. Via hard work, authenticity, creativity, dedication, reputation, and talent, she was able to build an audience that was very ready to buy her book the day the book was available. Imagine the two-way conversation companies can have with their most loyal customers, and the benefits derived from such a conversation. Obviously, there are risks involved. But companies have a huge opportunity to obtain information about their best customer's interests and preferences, all for free. At minimum, the database marketer could capture the fact that avid customers are willing to comment, and figure out how best to use this information to better serve the customer. Over the next five years, companies are going to figure out how to replicate this blogger's success in their business model. It should be interesting to see how this develops. Database Marketers frequently analyze the impact of shipping and handling rates on top-line sales and bottom-line profit. Amazon.com released second quarter results last week. Their 10-Q filing illustrates shipping and handling revenue. For the first six months of 2006, Amazon received $257 million in shipping revenue, 5.8% of net sales. During the same time period, Amazon incurred $385 million in shipping expense, 8.7% of net sales. In total, Amazon lost $128 million dollars shipping merchandise, or 2.9% of net sales. Amazon accounts for shipping revenue in their net sales line, and accounts for shipping expense in their cost of sales line. As you may know, most direct marketers at least break-even on shipping expense, with many direct marketers realizing a profit on the shipping of merchandise. Amazon cannot possibly drive enough sales to offset the loss in shipping revenue. A ten percent increase in sales due to free shipping only results in an ever-increasing disparity in shipping revenue and expense. There are instances in the document where Amazon states that their goal is to drive down expenses. And this is where the strategy becomes plausible. Without shipping and handling expense, gross profit was 28.5% of net sales. After accounting for shipping and handling expense, gross profit was 23.9% of net sales. In other words, free shipping significantly decreases gross profit. Therefore, if Amazon can reduce cost of goods sold, they can offset free shipping, and maintain profitability. By applying the hammer to their suppliers, they reduce the cost of goods sold, thereby covering shipping expense, theoretically passing the savings along to the customer. There is a flip side to this. Take my book, as an example. After accounting for shipping and handling expense, Amazon earns between seven and eight times as much profit as I earn from the sale of one of my books. By completely hammering the supplier (my publisher), they pass along free shipping to you. So enjoy your free shipping next time you order from Amazon! Somebody is paying for it. It isn't Amazon, and it isn't you. Seth Godin has a brief post on belief. Database Marketers, especially those who work in the field of Business Intelligence, struggle with belief. Anytime a BI person has to share facts with people, beliefs are likely to override facts. If I had a dollar for every person who believed their opinions over my facts, I wouldn't have to work anymore. The best you can do is work with honesty, integrity and humility. If people choose to disagree with your facts, let 'em. Show that you consistently act with honesty and integrity, and over time, people will be more likely to agree with your information. Database Marketing and Business Intelligence are about the long-haul, not about making a short-term splash. Circuit City shares (NYSE: CC) have tumbled by more than twenty percent in the past three months, though some pundits feel Circuit City is in the midst of a financial turnaround. In the three months ended May 31, 2006, Circuit City posted a pre-tax profit of $7.8 million on net sales of $2.6 billion, yielding an approximate pre-tax profit rate of 3%. A year earlier, Circuit City lost $19.2 million on sales of $2.2 billion. This helps defend pundit opinions that Circuit City is improving their business. Circuit Cirty SEC filings indicate that their US-based business is performing better than their international business. International business, primarily in Canada, generated an after-tax loss of $4.3 million, whereas the US-based business generated an after-tax profit of $9.3 million. Multichannel statistics are interesting. Comp-store sales in the first quarter grew by 14.5%. However, online sales are included in comp store sales. Therefore, retail comps were greatly influenced by an 85% increase in web-originated sales verses last year. This should make multichannel pundits happy. Circuit City is continually lauded for its "buy online, pickup in store" program. The increases should also make Circuit City executives happy. Given that Internet Retailer estimated that online sales were 7% of total Circuit City sales in 2005, an 85% increase in online sales contributes about five of the 14.5% point increase in comp store sales. Reporting online sales in comp store sales overstates overall comp store productivity. Circuit City operates four divisions. Video represented 44% of first quarter sales, and produced double-digit increases in the first quarter. Information Technology, representing 29% of first quarter sales, experienced a low-double-digit increase, led by notebook computers and printers. Audio, representing 16% of the business, experienced a double-digit comp store sales increase. The entertainment division, 11% of the business in first quarter, experienced a single digit comp store sales increase. The company expects continued growth in flat-panel televisions, portable digital audio, and notebook computers. Circuit City offered guidance that it expects to achieve net sales growth of between seven and eleven percent, and earnings before taxes of between 2.0% and 2.4%. The company also states that it will continue to invest in multichannel activities. The results indicate that Circuit City is very dependent upon driving comp store sales increases to achieve profitability. Had comp store sales been below ten percent last quarter, it is unlikely that Circuit City would have generated a quarterly profit. The online channel is clearly contributing to the success of the business, in the first quarter. eBay announced a shakeup within its management staff this week, signaling continued change in their business. A review of their most recent SEC quarterly filing illustrates some of the issues facing the company. During the first quarter of 2006, sales increased a healthy 35%, from $1,031,724 last year to $1,390,419. Gross Margin decreased from 81.9% last year to 80.0% this year. This metric was partially influenced by changes in stock option expensing. Expenses, after accounting for changes in how stock options are expensed, have increased at a faster rate than sales have increased. Sales and Marketing expense increased by 39% verses last year. Product Development increased by 33%. General and Administrative expenses increased by 40%. As a result, income from operations decreased by 4% after accounting for stock options. Income from operations, on a comp basis with last year, only increased by 20% on the 35% increase in sales. In other words, eBay is not generating sales fast enough to cover rising expenses. Their filing indicates other interesting tidbits. PayPal is the fastest growing of the three mature business units at eBay, growing by 44% over last year. However, only 26% of PayPal dollars flow-through to profit. US Sales increased by 30%, and these sales flow-through to profit at a much more impressive 40%. The most profitable unit, International Sales, only increased by 25%, though these sales can be influenced by exchange rates. International Sales flow-through to profit at a whopping 48%. In other words, the fastest growing business areas at eBay generate the lowest rate of profit. This is not good for the future of eBay. Couple that with their purchase of Skype, which lost more than eight million dollars on sales of $35 million, and the profit story isn't great. Further compounding eBay's growth problems are subscribers. Although net sales increased by 35%, the number of active users, those active over the past year, only increased by 25% verses last year. This may indicate a future problem for eBay. PayPal accounts, measured as active users over the past three months, increased by 32% verses last year, a rate that is less than the rate which net sales are growing. The data may indicate that eBay is reaching maturity, as a business. Obviously, I don't know the inside workings of eBay, so any comments about eBay reaching maturity are purely speculative. It will be interesting to see if eBay can find additional ways to grow. In their 10-Q statement, management states that they may need to increase marketing and brand expenses. One of their quotes states that "Brand promotion activities may not yield increased revenues, and even if they do, any increased revenues may not offset the expenses incurred in building our brands. If we do attract new users to our services, they may not conduct transactions using our services on a regular basis. If we fail to promote and maintain our brands, or if we incur substantial expenses in an unsuccessful attempt to promote and maintain our brands, our business would be harmed." In other words, eBay may spend marketing dollars to promote business units, and those marketing dollars may not have a corresponding return on investment, limiting future growth. eBay's PayPal unit is facing increased competition from Google. And reports indicate that Microsoft has an interest in merging their MSN unit with eBay. The next few months could prove to be very interesting for a previous stock darling that has lost more than fifty percent of its market capitalization over the past eighteen months. Several years ago, my wife and I sold a home we had purchased forty-five months earlier. At closing, we were surprised to learn that we had to pay a $5,000 pre-payment penalty, because the loan had been paid off before four years elapsed. We paid the penalty. We did ask Bank of America to forgive the penalty, given that we had just taken out a mortgage that would generate far more interest in a short period of time than the penalty we were assessed. Naturally, Bank of America declined our appeal. Two short years later, we refinanced with Wells Fargo. To-date, Bank of America lost $100,000 of interest income, but gained the $5,000 pre-payment penalty. Try calculating the lifetime value of that decision! Bank of America makes their 10-K statements available on their website, www.bankofamerica.com. These financial documents tell a fascinating tale of the money-making machine that is Bank of America. In 2005, Bank of America received $34.8 billion dollars (yes, billion dollars) in interest and fees on loans and leases. For instance, when you make your $1,500 payment on your mortgage, the majority of that payment goes to interest, not to the principal on your home. Across all interest income categories, Bank of America generated $58.6 billion dollars of revenue. Amazingly, Bank of America only generated $27.9 billion dollars of interest expense, yielding $30.7 billion dollars of income. Bank of America also earns $25.4 billion dollars of non-interest income, including $7.7 billion dollars in service charges, things like ATM fees or annual fees on your credit card. Another $5.8 billion is earned on credit card income. So, in total, Bank of America earned $56.1 billion dollars of income. Non-interest expense was $28.7 billion dollars, yielding $24.5 billion dollars of pre-tax profit. $24.5 billion dollars of pre-tax profit. Bank of America then paid $8.0 billion dollars of income tax expense. And we wonder why big business is so influential in governmental issues?! After subtracting taxes, Bank of America took home $16.5 billion dollars of after-tax profit. It is amazing that we Americans don't raise more of a stink about how much money we give to banks, like Bank of America. We grumble over paying $3.50 for a gallon of gas, and feel frustrated when our annual gasoline bill is $3,000. We feel like the oil industry is gouging us. Yet, homeowners deal with a situation that is much more severe on their checkbook. A family with a $200,000 mortgage at a 6% interest rate pays as much as $8,700 a year in interest expense. If this family earns $50,000 per year, as much as a quarter of take-home pay goes to the bank servicing the mortgage. Add to that home equity loan interest, credit card interest, car loan interest, service charges and annual fees, ATM charges, and any other expense, and it becomes obvious that your local bank has control over your checkbook. Have you ever wondered why your popcorn and diet soda cost $9 when you visit the movie theater? It is probably because that is the only way that a movie theater can stay in business. A simple review of Regal Cinemas SEC filing for 2005 illustrates the problems facing movie theaters these days. Let's MineThatData, and understand how expensive concessions contribute to the profitability of this organization. Two-thirds of their revenue comes from ticket sales. The average ticket sold at a Regal Cinemas is $6.80. Twenty-six percent of their revenue comes from concessions, with the average customer spending $2.70. The fastest growing source of revenue is in other operating revenue. This category represents the advertising you see before a movie, as well as business meetings held in the theatre during off-hours. A movie theater is expensive to run. Let's break down some of the expenses at Regal Cinemas. Fifty-three percent of admissions revenue is gobbled up in film rental and advertising costs. This means $3.62 of your movie ticket are gobbled up by the movie industry. Of the $2.70 you spent on concessions, Regal Cinemas pays $0.39 for the product, pocketing $2.31 of your expenditure. The product you purchase at the concession stands costs about seven times as much for you to purchase as it cost Regal Cinemas to purchase. Wow. The remainder of your movie ticket is gobbled up by other expenses. Remember that $3.62 of your movie ticket goes to cover film rental and advertising costs. Another $1.27 goes to cover the rental expenses of the actual theater. Another $3.90 cover general and administrative expenses, depreciation, and an assortment of other costs. So, you spend $6.80 on your movie ticket. Regal Cinemas pays $3.62 + $1.27 + $3.90 = $8.79 per ticket to cover their expenses. See the problem? The theater has already lost $1.99 on you, the customer, the minute you purchase your ticket. This explains why the theater needs the $2.31 profit generated by concessions, and why the theater needs an average of $0.80 advertising revenue per customer, in order to survive. With movie traffic decreasing year-over-year, Regal Cinemas generates all of its profit from concessions and advertising. And as traffic continues to decrease, Regal Cinemas continues to ask its most loyal customers, the ones still going to theaters, to pay more and more money on food, and to watch more and more advertisements. This is the way Regal Cinemas is trying to remain profitable. It should also be noted that almost half of the profit Regal Cinemas generates is gobbled up by interest expense. $0.19 of your $6.80 ticket go to cover the interest on debt that Regal Cinemas has. This is a business model that is tough to profitably manage. The next time you decide to boycott the $9 you will be charged for popcorn and a diet soda, consider the alternative --- that one day in the not-so-distant future, the theater industry just won't exist.